Happy Friday! Can you believe it's the middle of July and it's only going to be 70 degrees here this weekend, surely doesn't seem like summer to me! This weeks Bloggers Challenge is A Stitch in Time. What exactly is that you ask? Simply use any type of stitching on your project..Faux Stitching, real sewing machine stitching, you get the idea. If you'd like to play along, simply leave a link in the comments section, we'd love to see what you've stitched up! For my project, I used the Drywall Stitching Technique from a past issue of the TNJL. My project also fits this weeks Shirleys2Girls Challenge - Create a Shaped Christmas Card. I have one of those small mini sewing machines, but I tell you the dang thing has never worked right since day one - I guess you get what you pay for. I do a lot of my design work late at night when my family is in bed, so dragging out the big sewing machine is out of the question, might make too much noise, besides the Drywall Stitching Technique is just so quick and easy, I can stitch in a matter of seconds! I started out with a 4-1/4" square card. I cut my Merry Moments DSP from Stampin' Up! into 1-1/8" squares, adhered a piece of Stampers Magic Tape to the front panel, then placed my DSP in a quilt pattern. I added the Drywall Stitching, using a ruler so my stitches would be straight. I used a large Spellbinders Circle Die to cut my circle, leaving an overlap at the top so my ornament would open. To create the holder thingy, I punched a square from Silver card stock, ran it through the Big Shot using the Distressed Stripes CuttleBug Folder, then clipped the bottom with a Square Scallop Punch. Punch a hole and add your ribbon. Stamp your sentiment inside or add a photo. Now your card can double as a Christmas Ornament! Thanks for stopping by, be sure to click on the Bloggers Challenge Logo on my sidebar to see what the other Challenge Members stitched up this week! Have a great weekend! So stinkin' cute! I really like it! I love it! And the top of the ornament is very clever too! This is super adorable! 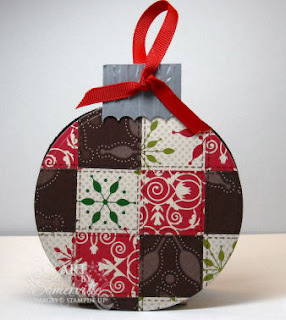 I love the quilted ornament idea - into the idea file this one goes ! Adorable! Thanks for playing the TT challenge! Great idea on the quilted ornament! Love it! This is just too stinkin' cute!! I love everything about it!! AND it is going to be in the 70's here too. Where abouts do you live?? This is so pretty! Love your patchwork with that DSP and your stitching is great! Great challenge today! OOOH, so cool! Love that! OMG this is so cool. I love the quilted look of this ornament. Not sure what "drywall" stitching is but I like how it looks on your project. Great ornament card! Love the quilted look. AWESOME! love that quilted Ornament!! You are always so clever! Adorable ornament and love the dry wall stitching! Love the shaped card...especially the detail of the texture on the silver! Super cute! Lisa - This is absolutely amazing! I love everything about it! Thanks so much for playing Twisted Thursday with us! What a fabulous idea for a shaped card, Lisa! Love the quilted look, too. Too cute!! Love the quilted look! Never heard of Stamper's Magic Tape, but it must be pretty cool stuff! Thanks so much for playing the S2G Twisted Thursday challenge! We look forward to seeing more of your beautiful work!! Your ornament is so cute, I love the way it looks!